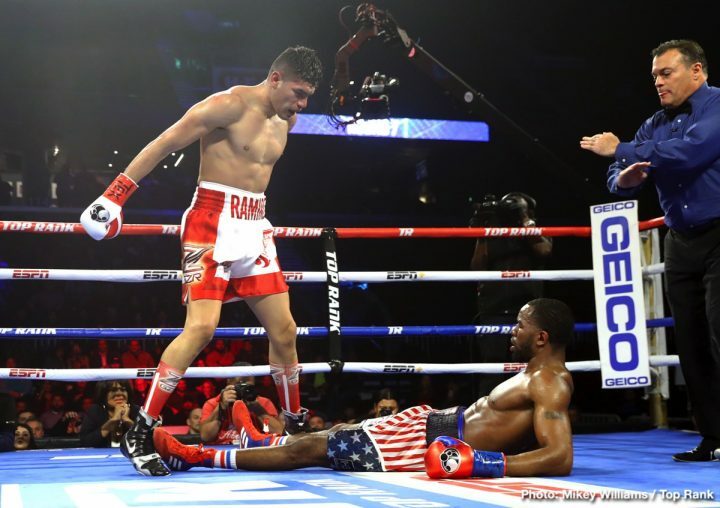 By Allan Fox: Top Rank promoter Bob Arum is interested in a possibly setting up a fight between Gilberto ‘Zurdo’ Ramirez (39-0, 25 KOs) and WBO light heavyweight champion Sergey Kovalev (33-3-1, 28 KOs). Kovalev vs. Ramirez would be shootout if it happens. Ramirez likes to brawl, and he doesn’t seem to know his own limitations yet. Part of the reason for that is the match-making that’s been done for him by Top Rank. Ramirez hasn’t had to face anyone with power that would make him change his fighting style. Someone like David Benavidez or Callum Smith would be a big problem for Ramirez at super middleweight. Kovalev will have a great time against a guy like Ramirez. Someone that’s there for him to hit. Kovalev needs an opponent for his next fight after recapturing his WBO 175 lb title last Saturday night in beating champion Eleider Alvarez by a 12 round unanimous decision in Frisco, Texas. Kovalev is interested in unification fights against one of the other champions at 175, but Top Rank boss Arum could have other ideas by possibly matching him against Ramirez in what would be an in house fight. Ramirez, 27, has been the World Boxing Organization super middleweight champion for the past three years since dethroning Arthur Abraham in April 2016. Ramirez is starting to have problems making weight for his fights at 168. The 6’2 1/2″ Ramirez has always been big for the super middleweight division, but after 10 years as a pro, it’s becoming difficult for him to make weight. Ramirez isn’t giving up his WBO title just yet. He’s going to go up to 175 and test himself against one of the other champions first. If he does well, then he’ll likely stay at light heavyweight permanently. If he Ramirez loses or struggles badly and wins, he’ll probably drop back down to super middleweight and continue to defend his WBO belt in that division. There’s not real pressure on Ramirez at this time if he moves back down to super middleweight, because the WBO’s rankings is woefully bad. The WBO has ranked a lot of beatable guys that Ramirez can likely beat without any problems. Unless the WBO improves their rankings at 168, Ramirez could hold onto their belt for many years, as long as he can continue to make weight. “Arum has been talking about Gilberto Ramirez and that would be interesting. There’s also an Anthony Yarde mandatory coming up soon,” Kovalev’s co-promoter Kathy Duva said to Boxingtalk.com. Ramirez would be made to order for Kovalev. Gilberto has very little punching power, and he would likely try and beat Kovalev by a decision, which won’t be easy to do. Kovalev has the better boxing skills and the far better power. Ramirez would need to try and tire Kovalev out by setting a fast pace like Andre Ward did in his two wins over Sergey. Ramirez is more of a slugger than Ward, and that would likely be his undoing. Ramirez hasn’t fought a guy with the kind of punching power that Kovalev has going for him. If Ramirez slugs it out with Kovalev, then he’s going to get hit a lot and likely taken out before long. It’s a good fight for Ramirez to get his name put there. He’s been in the pro ranks for a decade now, and he’s facing to win over a huge fan base with the American boxing fans for lack of competition. If Ramirez had been matched as tough as Saul Canelo Alvarez has been, he would have carved out a large fan base ages ago. This could be Ramirez’s big chance to increase his popularity by beating Kovalev. A very healthy looking Kovalev defeated Alvarez by a 12 round unanimous decision last weekend at The Ford Center at The Star, in Frisco, Texas. The scores were 120-108, 116-112 and 116-112. It was a pretty easy fight to score. Kovalev appeared to win the fight by an 8 rounds to 4 score over Alvarez. Boxing News 24 had Kovalev winning by a 116-112 score just like two of the judges had it. “Kovalev is going to be fighting on ESPN and so is Gvozdyk and so is Beterbiev,” Duva said. If it’s not Gilberto Ramirez that Kovalev faces, then it’s going to be one of these guys: IBF light heavyweight champion Artur Beterbiev (13-0, 13 KOs), WBC champion Oleksander Gvozdyk (16-0, 13 KOs) or WBO mandatory Anthony Yarde (17-0, 16 KOs). The tougher fights of that bunch would have to be Beterbiev or Gvozdyk. Those are talented guys that would give Kovalev some problems with their punching power. Ramirez would be the best option for Kovalev if he wants to make sure he wins his next fight. That’s not a knock on Ramirez. He’s a good fighter. He’s simply not equipped power-wise to fight at light heavyweight against punchers like Kovalev, Beterbiev or Gvozdyk. Further, Ramirez doesn’t have the boxing skills of Dmitry Bivol. Ramirez is better off staying at super middleweight if he wants to stay a champion for a long time. With WBO’s weak ranking, Ramirez has nothing to worry about in terms of looking contenders that can take his belt from him.